A goalkeeper performed tricks with a stray dog when it ran onto the pitch during a National Football League match in Georgia. Spectators watched on laughing as the pup bounded across the field and played with the footballers. 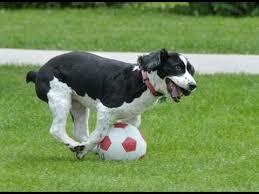 The dog spent around three minutes on the pitch, where it was unable to be caught and disrupted the game. Security tried to drag the dog forcefully from the turf, but it escaped and ran away. After many attempts at distracting the pooch, Torpedo Kutaisi player David Khurtsilava was able to coax the dog to the sidelines. Once play had resumed, Dila Gori and Torpedo Kutaisi drew 0-0 in Sunday’s match.